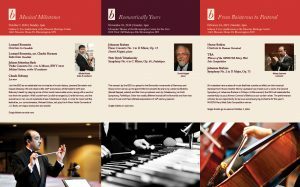 This post is the final entry in the Concert Preview series for the Bloomington Symphony Orchestra’s October 6 concert, entitled “Let Us Begin.” We hope you enjoyed Manny’s Musings and will check back later for previews of pieces from upcoming concerts. Most composers who are regarded as “symphonic’ composers begin their foray into symphonic form relatively early in their careers. Shostakovich and Mendelssohn wrote their first symphonies with Opus numbers of 10 and 11, respectively. There are certainly many other examples that are similar. So, for many it is a startling revelation that one of the greatest symphonists has as the opus number for his first symphony as Opus# 68! By the time Johannes Brahms, originally of Hamburg, Germany had completed and premiered his Symphony in C minor, he had already premiered numerous chamber works, choral music, orchestral serenades, and piano sonatas. Furthermore, his compelling Ein Deutches Requiem and the G minor piano quartet were familiar to his followers. He was, by the time of the symphony’s premiere in Baden on November 4, 1876, in the middle of his extensive output of compositions. Much is made of Brahms’ reluctance to write the C minor symphony. Even his publisher, Fritz Shimrock, would come to badger Brahms regarding his lack of a symphony for him to publish. 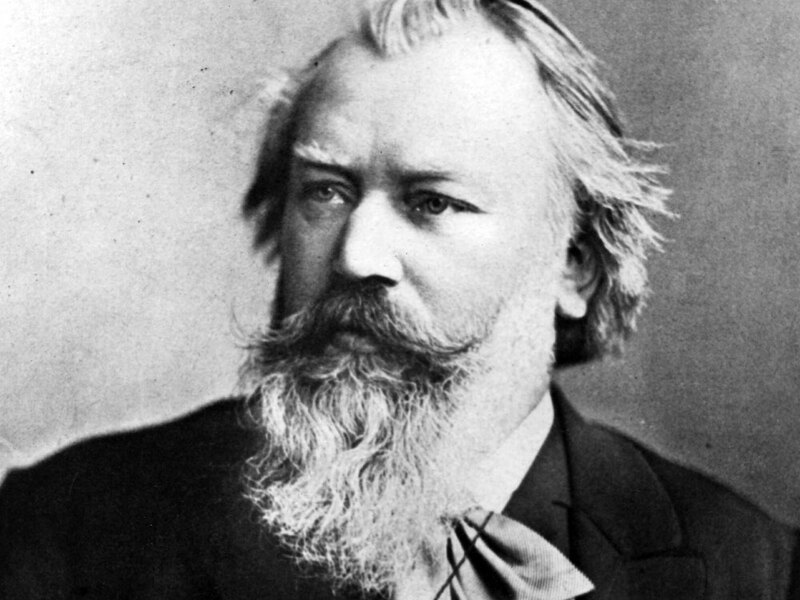 In fact, it took Brahms approximately 14 years from the first time pen met paper to the Karlsruhe premiere conducted by Otto Dessof. Even after that premiere came several revisions that became part of final printed history in 1877, a year later. To say that Brahms’ respect for the works of Beethoven was profound is an accurate statement. Throughout the first movement and the finale, Brahms’ paean to Beethoven is clear and unhidden. This is not to imply that there is a sense of copying Beethoven in any sense. However, the power of the the incessant three short notes followed by a longer note that are developed furiously in the first movement have Beethoven’s fingerprints all over them. As one listens, the four notes hammered away by trumpets and timpani as the strings wail at the climax of the development have clear ingenuity to them. The first movement closes with the clip-clop of an ever-present horseman delivering the message that a new voice has come to symphonic writing. The eloquence that one heretofore has always associated with the poetic slow movements of Beethoven meets its challenge in the E major slow movement. The direction of the music seems to constantly ascend without ever truly releasing it’s gentle grip of the listener’s ear. From solo oboe to clarinet, from concertmaster to solo horn, the music is a lightly passionate “slow dance”. The pastoral quality of the third movement is a walk through nature that seems to portray what is seen by our perambulating host. Almost like Smetana’s The Moldau we embark on a journey that is best left to the mind’s eye of the listener. The finale and its brooding beginning give way to conspiratorial footfalls and what can only be described as a thunderclap that clears the air in the manner of Donner at the end of Das Rheingold. The succeeding alphorn theme serves as a bridge to a hymn delivered by the trombones who having been laying in wait for a full three movements until just the right moment. As Beethoven seemed to embrace the world with the hymn known as the “Ode to Joy,” so does Johannes Brahms in his glorious theme that takes us in to one of the most cataclysmic moments in the symphonic repertoire. The Bloomington Symphony Orchestra’s newly appointed Artistic Director and Conductor Manny Laureano has put together his first season of programs for the BSO. The season promises to be a celebration of firsts, as the conductor and musicians begin a new era of making music together. 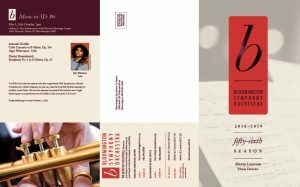 The BSO’s fourth annual concert at Immanuel Lutheran Church in Eden Prairie, this year on Sunday, November 24, is entitled “Sit Right Back and You’ll Hear the Tale.” This concert includes programmatic pieces including Borodin’s Overture to Prince Igor, as well as the Polovetsian Dances from the same opera. The concert will end with Rimsky-Korsakov’s musical tale of Scheherazade. On Sunday, February 16, 2014, the BSO will celebrate “The Passion of Rachmaninoff,” with a concert program of Wagner’s Overture to Rienzi, Mozart’s Violin Concerto No. 5 in A Major and concluding with Rachmaninoff’s passionate Symphony No. 2. The BSO’s concertmaster, Rebecca Corruccini will make her annual solo appearance at this concert. The BSO will conclude its 2013-14 season with “Music in 3D,” a nod to the imagination that music inspires. “Music in 3D” includes Death and Transfiguration by Strauss, The Swan of Tuonela by Sibelius and Respighi’s well-known piece, The Pines of Rome. This concert will also feature a performance by the grand prize winner of MNSOTA’s Mary West Solo Competition. 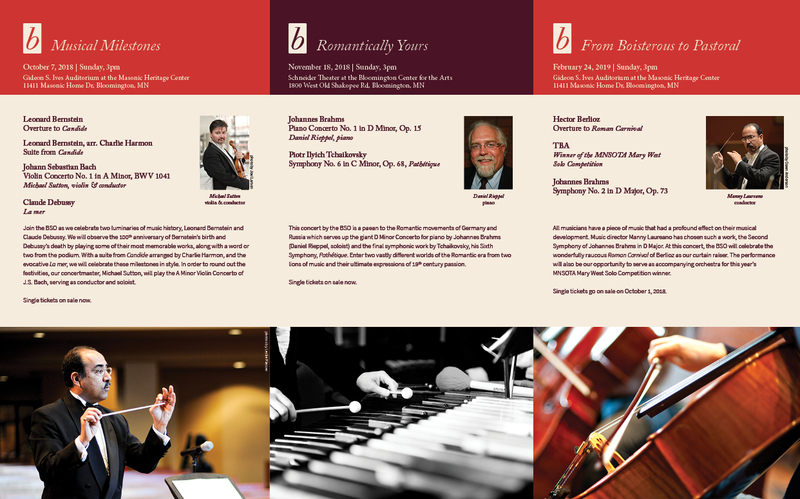 Season and single concert tickets are now available online through the Bloomington Box Office or by calling 962-563-8575. Tickets are always available for purchase at the door. Single concert tickets are $14 for adults and $12 for seniors. Discounted season tickets are $48 for adults and $40 for seniors. Students with a valid ID are admitted free, thanks to our generous sponsors.